Abuja – President Muhammadu Buhari felicitated with Nigerian football star, Asisat Lamina Oshoala, for winning the CAF-Aiteo Women’s African Football Player of the Year. President Buhari, in a statement issued by his Special Adviser on Media and Publicity, Mr Femi Adesina in Abuja on Saturday, congratulated the Falcon’s team member and all football lovers for the most deserved honour. According to him, Oshoala’s achievement will naturally translate into more responsibilities for exploits on the football field, and her country. Oshoala,23, had on Thursday beat Cameroon`s Gabrielle Aboudi and Chrestina Kgatlana of South Africa at an event organised by the CAF in Accra, Ghana. Oshoala after some few years with Liverpool and Arsenal Ladies now plays with the Chinese Club, Dalian Quanjian F.C. 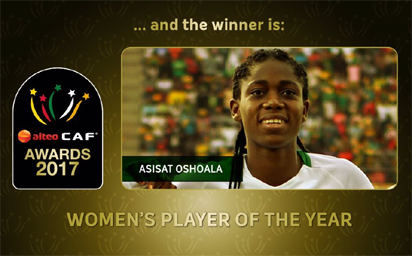 The post Buhari congratulates Asisat Oshoala for winning CAF Women’s Player of the yea appeared first on Vanguard News. 2019: How does Buhari play his last card?